I've just started using one of these and I'm really pleased with the sound quality. I've been through a few systems over the last 30+ years of exploring audio gear. I've been blessed occasionally with finding really good value..bang for the buck, and there's a certain level of satisfaction in doing this. I mean anyone can take a dump truck full of money and throw it at the high end audio store of their choice..and come out with a nice set up. It becomes progressively more difficult with less money invested...choices are way more difficult. I'll say right here that if this amp has enough power to match the speaker and room combination you have without pushing it too hard, this is an excellent choice. With small bookshelf speakers and medium floor standers, and with small to medium size rooms, this amp will shine with good speakers and good sources. It has detail and body without going overboard..and there's sufficient bass. You also can't complain about it sounding dry or thin, which are typical comments for reasonably priced solid state gear. If you try to push it too far, it will probably disappoint. Heavy metal played at wide open volume just isn't going to work. Very large, inefficient speakers may not be a good match in larger rooms. But when used within it's limitations, it's a very musical amp..one that's very easy to enjoy..especially when you spent so little for it. I found a nice used copy that's about 7 or 8 years old and used carefully. After doing some reading, and looking at schematics, I believe everything I written here would apply to the C316BEE also. The 315 and 316 models are almost identical...except for the "greener" circuitry that drops the standby wattage considerably..if that's really a concern and if you're too lazy to use the rear mounted switch. Really? So what we have here is a no brainer for someone just getting started and wanting to build a nice system. It's a gateway piece that can give a pretty good look into quality 2 channel sound...with the right speakers and a good source. Even the headphone output is OK..driven by the outputs and not an opamp. Actual weaknesses are difficult to find. Yes, it's minus a phono input..look at newer models. Yes, it comes in a plain black wrapper...c'mon..at this price point..whatd'ya expect? Find a good working copy, plug it in, and enjoy! Speakers I'm using are Wharfedale Diamond 225...a very nice match. So two people rip this amp for what? Drawing 20 watts if you don't turn it off? The other guy I couldn't even understand what the heck he was saying. They both don't review this amp, instead harping on some minor issues. I have a NAD 315BEE integrated amp coupled with an NAD 515BEE CD player. Playing through a pair of PSB Alpha B! speakers. I never want to leave my room again! I have never head such a nice amp at 40wpc. What really cool is how dynamic the music is. When the vocals cry out, they cry out, same with the instruments. At 9 o'clock the amp fills my room. I tried the amp to power my big Axiom M80s in my living room. Not powerful enough, but pretty good for the amps size. Seriously, best amp I've ever heard for a smaller room and bookshelf speakers. This amp it was my second chance to NAD. Before this one, I had the NAD C352 for a while, then I sell it. I bought this one based on the constants reviews speaking well of NAD (including EISA award 2008/2009). I had changed virtual all components around the NAD, including buying a DAC just to find the source for bad sound. However, after change the amp, by other not NAD, it was clear that the NAD don't worth it a single penny! The old story that 100$ extra in NAD models makes all the difference it's the prove of that. How can some one say, as it happens, that the model C352 has much better sound than the C315 bee? It's only true if the C315 really s***s! The story that says that NAD focuses in simplicity to arrive better sound it's a big lie. Not true at all. Can listen to it for hours and hours, very very good remote. The transformer makes a little hum. The volume sometimes makes a "Shuisss" sound when i turn it up or down. This is a beautiful amplifier. It looks tiny but can do serious damage to other amplifiers that are rated a higher power. Sound is very pleasent, works very well with monitor audio, i have mine pared with MA RS6 and it sounds amazing. Great detail, smooth sound especialy the voices, not tiering at all. Very good treble, not that TZTZTZTZ treble but smooth, and almost earth shaking bass. All and all this product is very good for it's price. I recomend it. Real hi-fi at small price!! Power, detail, not tiering, can listen to it for hours and hours, very very good remote. Sound si very pleasent, works very well with monitor audio, i have mine pared with MA RS6 and it sound amazing. Power Button in the back of amp - stupid solution!!!!! Uses 20 Watts in Standby mode!!! Much too much! For example Denon Amps use under 1 Watt in Standby. 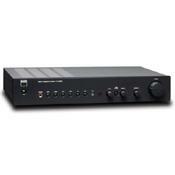 This Amp has very nice, simple design and is good small - great for my small room. I love this NAD design. Sounds really nice and transparent, enough details as for myself. Bass is good - I'm not a bass fanatic, so I'm glad with this amps bass. Treble and mids have many details and good definition. Remote control is the best one i've ever seen - so simple, only important functions, but all youll ever need! I like this, cause often used in darkness, so you never miss the buttons. i also like the amps simplicity, everything is clear, no features that disturb. BUT: One weakness that disqualifies this one! It has 2 Power-Buttons. One in front that only makes Standby and a real one in the back. Goddamn, why such a stupid solution - who wants to search a button somewhere in the back of the amp, between cables??? And the worst: it BURNS 20 Watts in the Standby-mode!!!! hell, thats nearly as much as my refrigerator!!! What went wrong with you NAD-engineers??? thats a complete failure! It goes to ebay and maybe if they fix this Power-problem ill buy it again. Probably the best value for money amp at this price range. Bass does bloom just a little, but you can easily correct this by choosing speakers carefully. Not really a problem. An excellent amp. Well balanced. Good wide stereo staging. Voices and instruments do not flow into each other. Good bass. It is rated at 2 x 40 watts in 8 ohm but is much louder because it delivers 2x95 watts dynamically at 8 ohm. This amp likes all types of music. From classical to jazz to hip-hop to progressive rock resolution is excellent. Warm sound. I could whine about the fact that it doesn't have a phonogram input, but that just means you will need a phono stage to play your LP's. Tone defeat switch so you can bypass the bass and treble adjustment circuit. Of course there is also a balance adjustment. Inputs are: CD, Tuner, Tape, AUX, Disc and MP. MP is for a media player such as an iPod. Comes with remote NAD Amp 1 that can also control a NAD CD player. There is no bling-bling features and flashy displays here as is NAD's policy - music first. You can connect 4 ohm or 8 ohm speakers to this amp. I have it connected to 2 floorstanding 8 ohm speakers rated at 200 watts and it drives them effortlessly. So you can choose between shelf and floorstanding speakers. I would not connect this amp to speakers with huge bass units, though. A new legendary amp is born.